Above The Princetones From New Jersey;Peter Prince (Lead),Larry Williams,Tom Ruggeri and Mike Paladino. They have an unreleased side_Guardian Angel. 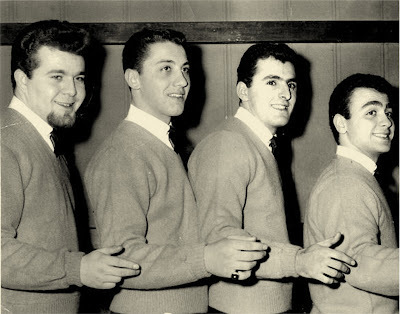 Tom Ruggeri (Baritone), Ronnie Quattrocchi (Falsetto Lead) not show in the picture,Vinnie Allessi (Tenor), Peter Prince (Bass-Baritone) and Nick Petrone (High Tenor-Falsetto). In October. 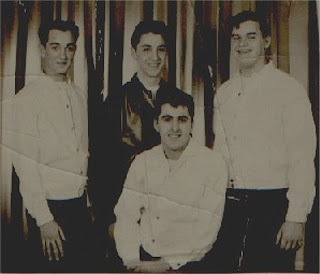 12, 1961, at the Manhattan's Broadway Recording Studio recorded for Trade Martin of Rome Records_ My Life/My Madonna. but the label never released these two sides.